Welcome back to Coleherne Court. Come inside. The unknown lady and her dog will be pleased to let you look around. 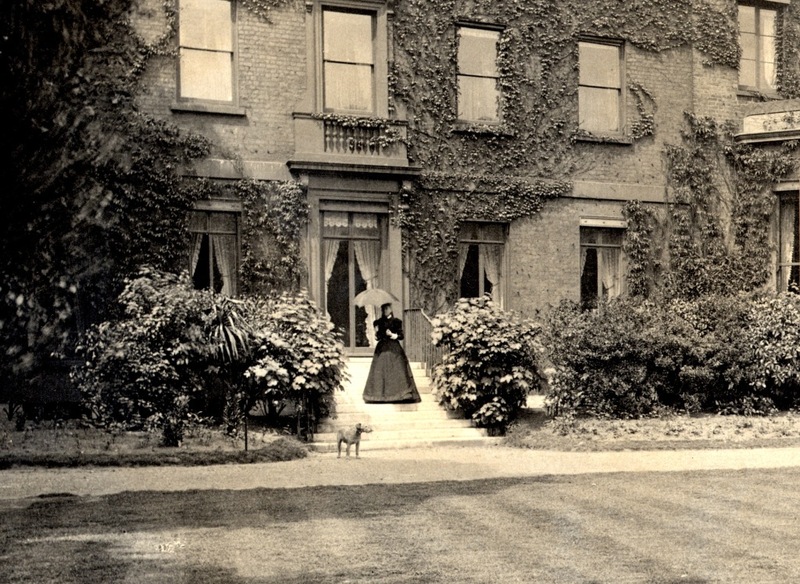 As mentioned last week Coleherne Court (aka Coleherne House) was occupied from 1865 to 1898 by Edmund Tattersall and his family. 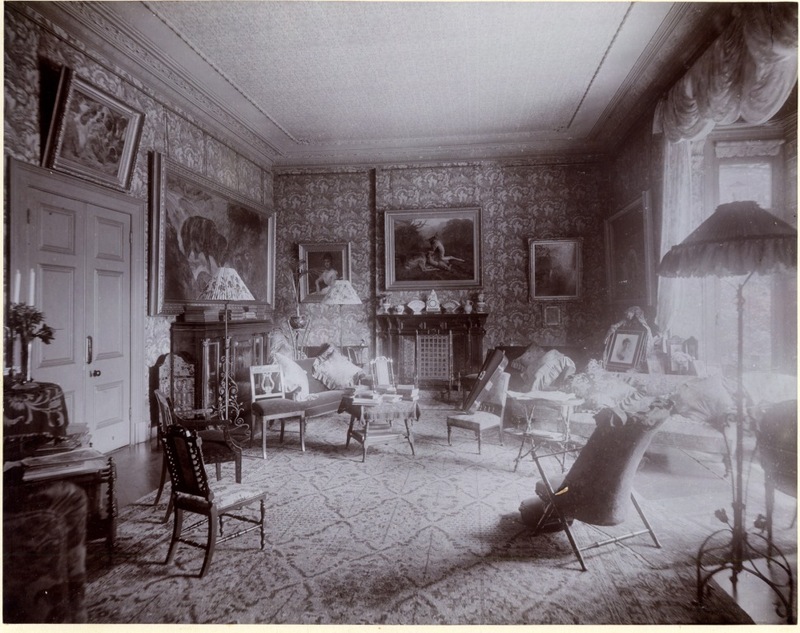 These pictures date from 1876 just after the end of what is sometimes called the High Victorian period in architecture and design. 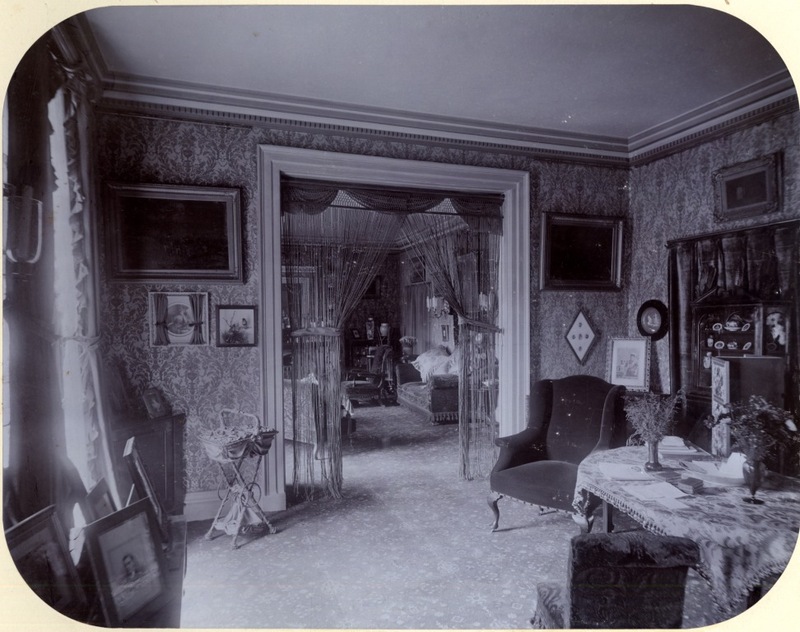 This was a time of highly decorative interiors, patterned wallpaper, oriental rugs and heavy polished wooden furniture. Also in this case some kind of animal skin hanging from the staircase. In my captions for the images I’ve called this a drawing room. I don’t know how accurate that term is but the impression I get of the room is opulence and excess. Patterned walls, patterned floor, patterned upholstery. A large number of cushions and pictures, and what looks like a beaded curtain. On the other side of the curtain is another room filled with objects and pictures. 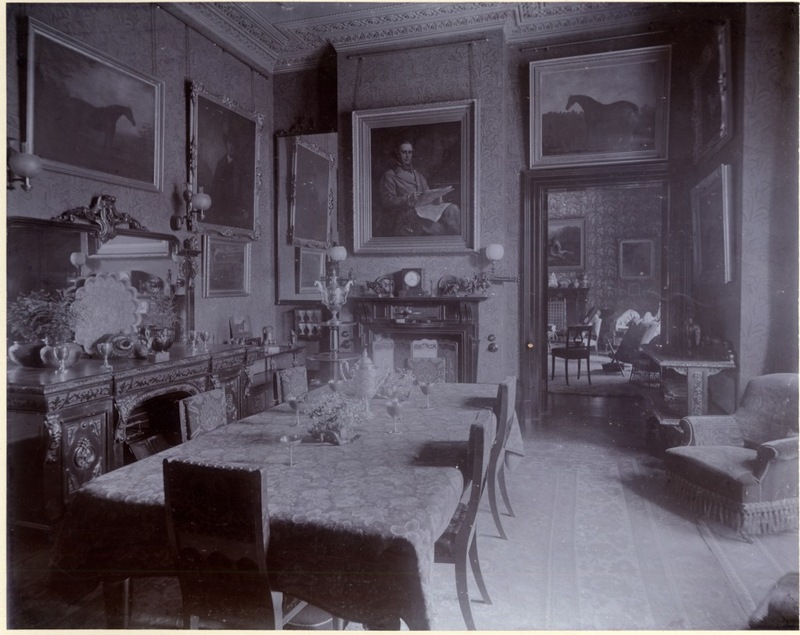 A stag at bay (one of several apparently in Mr Tattersall’s collection) and a portrait of a lady. 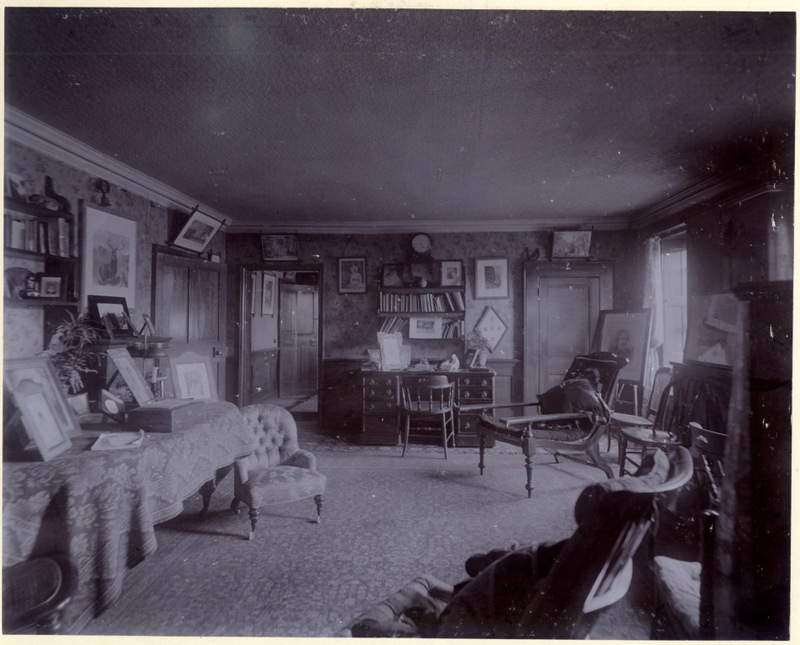 A writing desk is in the foreground with a flimsy looking chair. More wildlife is on display in the pictures. The light streaming in from the window is a little too much for the camera but gives the impression of summer weather outside. Is that a violin case perched on the chair? This was a musical household. 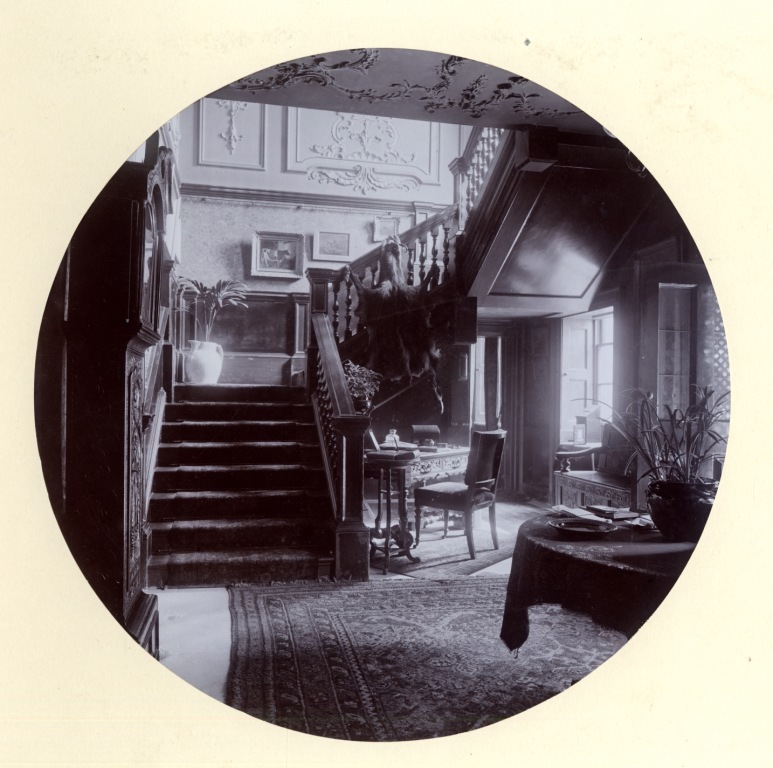 Mrs Tattersall was well known for hosting musical performances in the house. She played the piano, her daughter Ethel played the violin and her other daughter Violet sang. The two Miss Tattersalls also acted in plays put on at the house “Miss Tattersall’s Lady Stutfield was no less impressive as Miss Tancred’s Lady Windermere…..(she) was at once gay, coy and demure.” as one critic said. 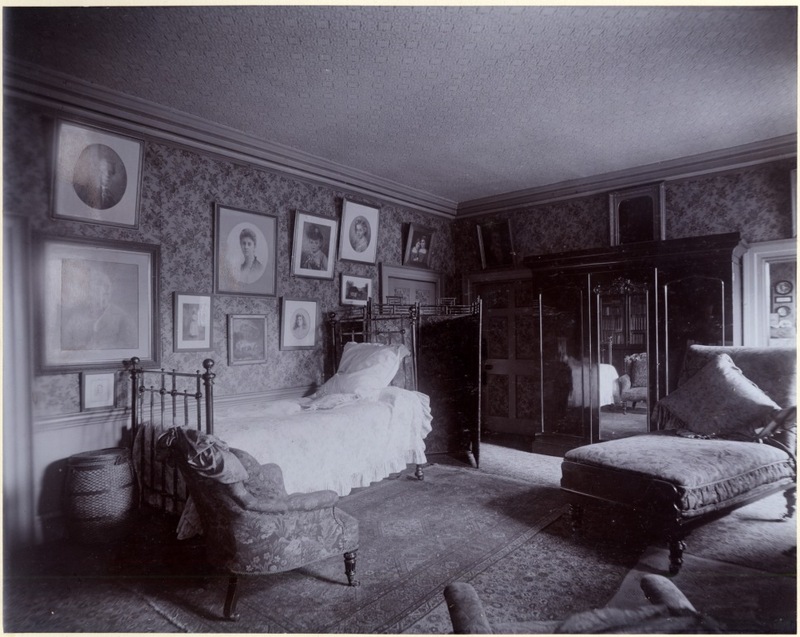 It boasts a daybed and its own collection of pictures, portraits mostly. Once again we have a view of the same room from the opposite direction. 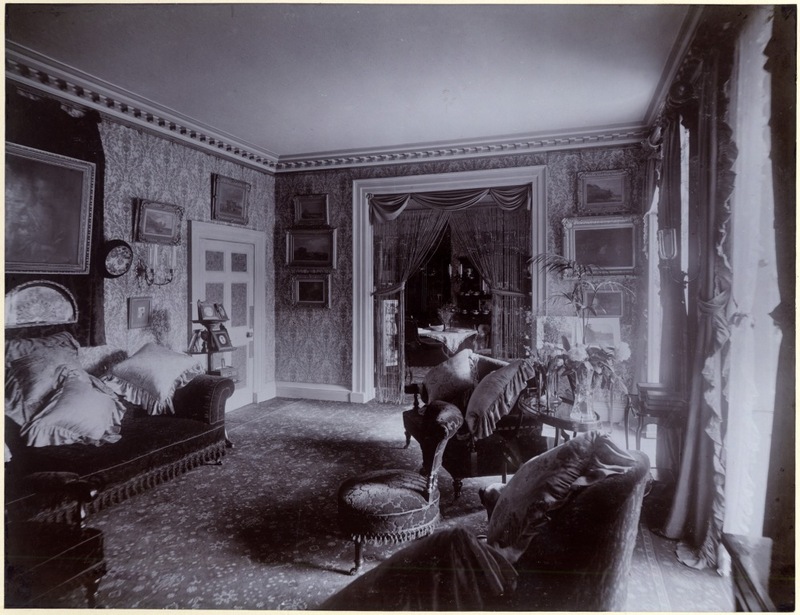 You can see that this is still a well-appointed room in which the occupant could while away many hours. 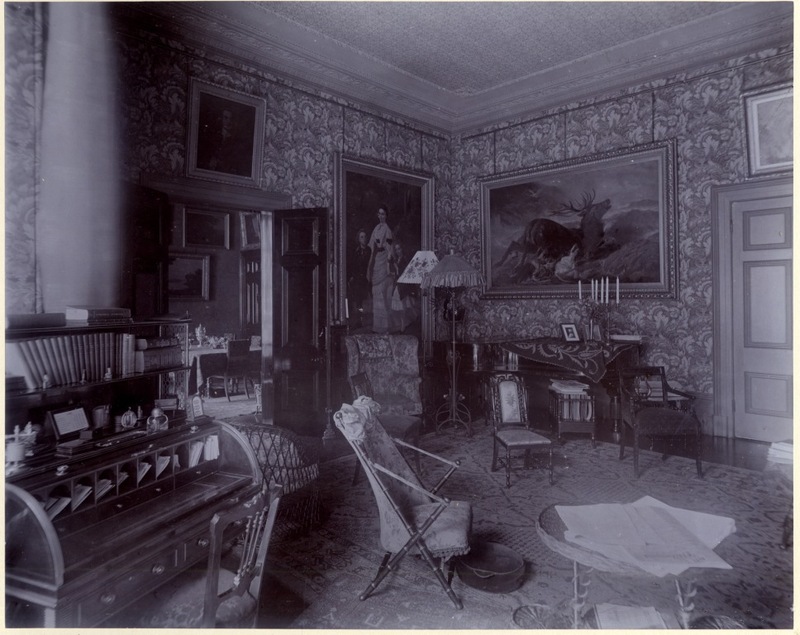 This looks like another sitting room, or a small study, again packed with pictures and books. I’ve assumed the room below is some kind of servant’s room, but I’m open to suggestions. 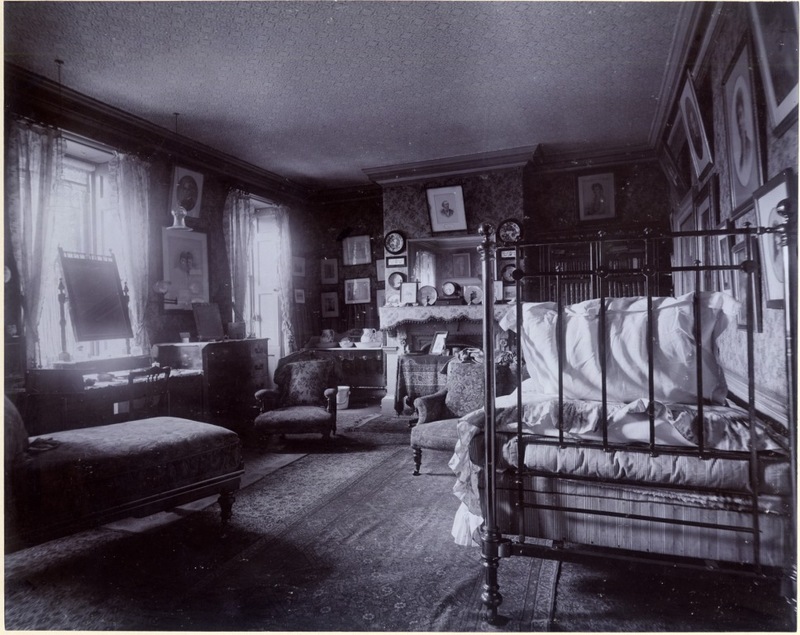 It looks quite comfortable so perhaps it could be a butler or housekeeper’s room. Now we can go outside again. 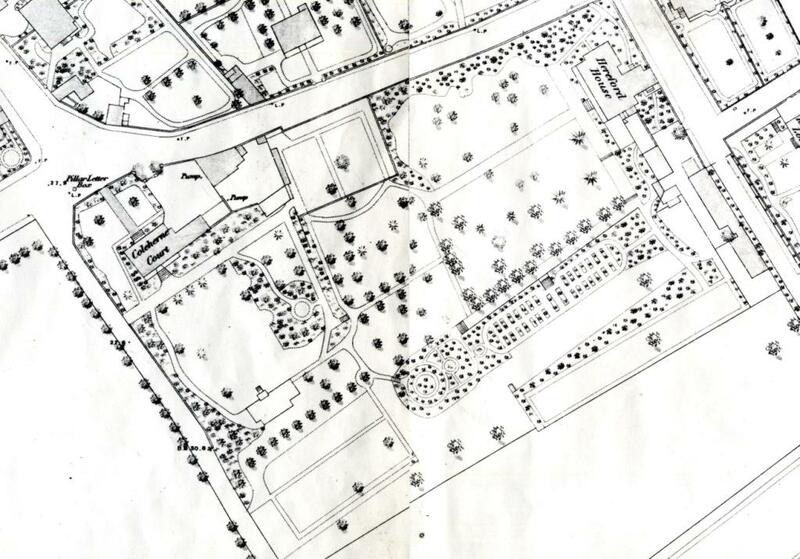 This OS map of 1865 shows the grounds at the time when Tattersall moved in. You can see that his house and Hereford House look like they are a fair distance from each other. You can also make out the location of the former fishpond which you could see on one of the maps shown last week. The map also shows the covered walkway into the house from the street and the tennis courts. 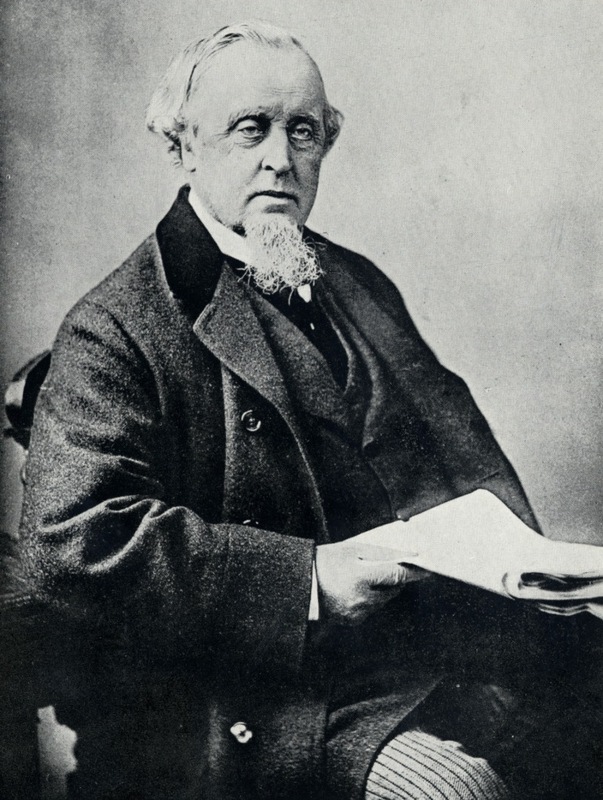 The property was described in Vincent Orchard’s book about Tattersalls as “well-wooded” with “a thick belt of oaks, elms, acacias and planes” sheltering it from the “obtrusive ugliness of Redcliffe Square”, which is quite a harsh judgement on Redcliffe Square, whose inhabitants at the time would have considered it a perfectly acceptable street in which to live. 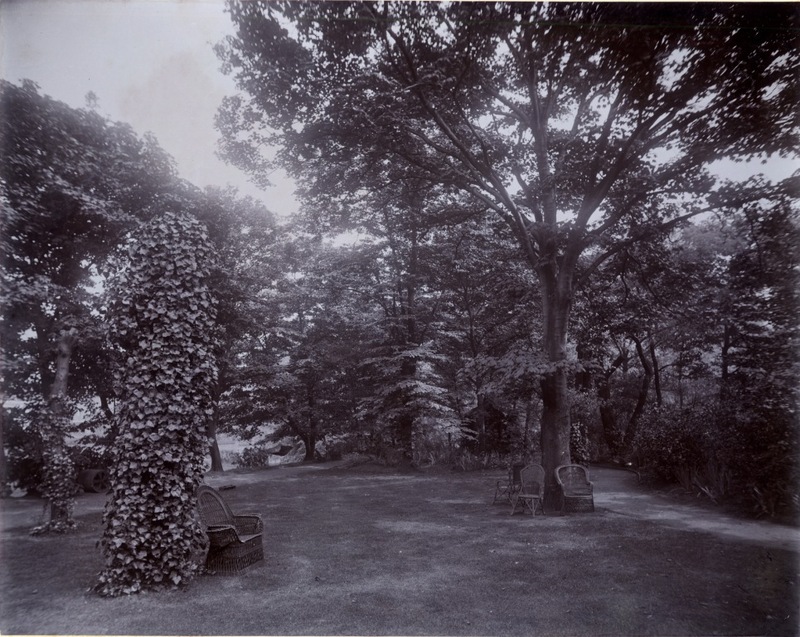 Nevertheless inside the walls of the property was a perfect example of a Victorian secret garden. A perfect lawn, secluded places to sit and feel yourself well protected from the growing city outside the walled garden. There were many paths to meander down on quiet afternoons and lose yourself in thought. 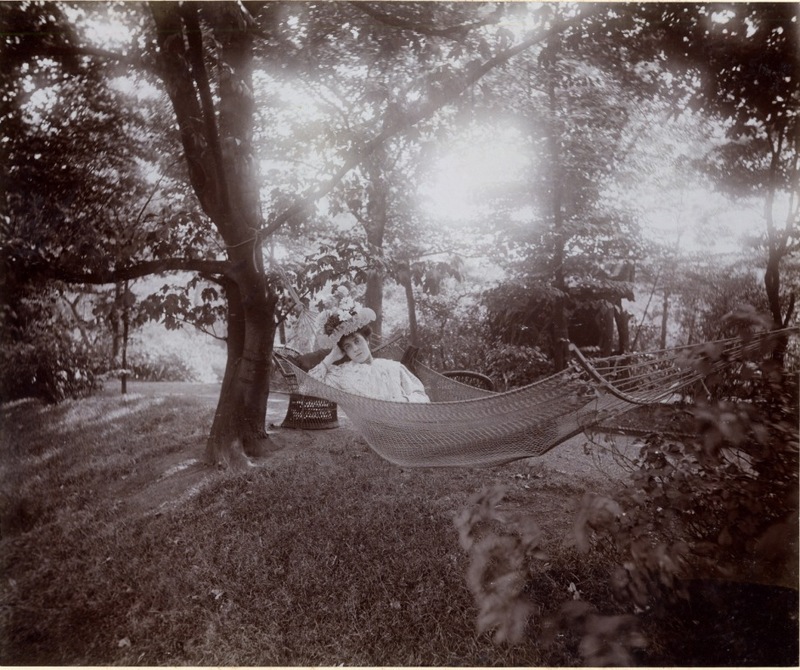 Or, like the lady in this final picture relax as best you could in the fashions of the high Victorian era, and imagine yourself in the country setting of Old Brompton just a few decades before. Forget about the summer in the city. Sorry, I started quoting song titles at the end there. That last picture is an amazing find in itself. I am enormously grateful to Miss Yvonne Wyatt who donated the album of photographs and some related papers to the Local Studies collection. 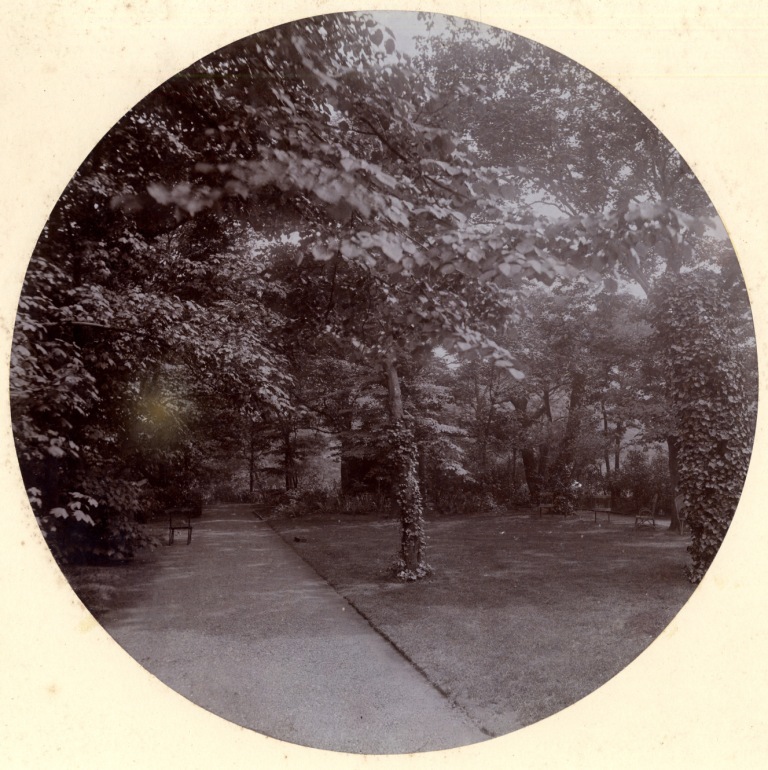 Also to her late brother Mr Tompkin who lived in the later Coleherne Court. No Local Studies collection can do without the generous donations of people like them. 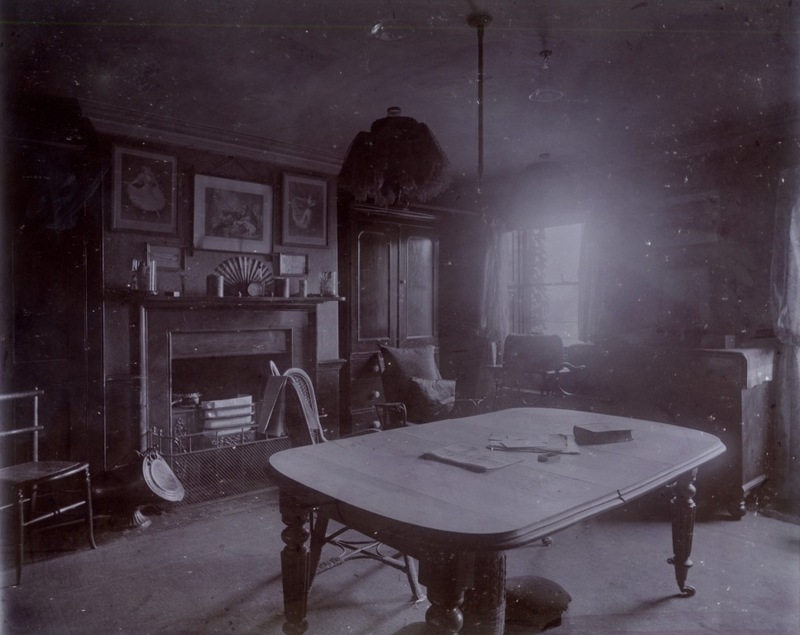 This entry was posted on Thursday, June 5th, 2014 at 12:33 am	and tagged with Brompton, Coleherne Court, Coleherne House, Edmund Tattersall, Tattersall family and posted in 19th Century, Brompton, Forgotten buildings, Interiors, Kensington. You can follow any responses to this entry through the RSS 2.0 feed. Great photographs. The last one showing a room looks as if it would have been the Housekeeper’s. The sewing machine by the window and the linen press in the corner indicate a woman’s room and one who is looking after the mending and storing of the linen. Stunning photographs and blog post! I really love the decorating style of this period. Many thanks. Thanks Mr Walker for such an exemplary job writing about Chelsea, what a treasure trove of great reading.